In 2015 it was the 'Fro Bros' of Adam Blair and Sam Thaiday inspiring Brisbane's premiership push but in 2017 a young triumvirate has taken on the mantle as the Broncos' 'Bash Brothers' as they chase another grand final appearance. Many pundits questioned earlier in the season whether Brisbane had the forward depth to challenge the top sides but Joe Ofahengaue, Herman Ese'ese and Tevita Pangai Jnr have taken it upon themselves to better the bench of every team that they play. With the destructiveness of Bryce Cartwright, Moses Leota and James Fisher-Harris awaiting to be unleashed by Panthers coach Anthony Griffin at Suncorp Stadium on Friday night Brisbane needs their bench at its barnstorming best in order to progress to next week's preliminary final. Pangai Jnr remains in doubt with a troublesome hamstring injury but both Ofahengaue and Ese'ese told NRL.com of the pact they made earlier this year not to let their teammates down when they enter the fray midway through the first half. "The last couple of years I think we've got it wrong on the bench," said Ofahengaue, who came off the bench for Brisbane in the 2015 Grand Final. "We haven't challenged the other bench as good as we're supposed to so this year we've kind of taken it personal; it's our bench against theirs. "The middle pack do their stuff for 20 minutes, they take the punch away from the game and all we have to do is come on and run hard. "When we're on their bench is on so it's our bench against theirs. That's our mentality. "That's what we've got right this year. Tevita checks all our stats so he always tells us if we've run over 100 metres. If we have then we've done our job." Adds Ese'ese: "The last three or four weeks me and 'Joffa' (Ofahengaue) and Tevita have been talking about dominating other benches. "That's kind of our motivation coming into the game and obviously bringing the energy and the impact that the boys need when the game gets tough. "Our job is to tackle hard and run hard so if it's either a big hit or a big run we all feed off that and gain a lot of energy out of that and makes each of us want to run hard and tackle hard too." Incredibly, ahead of Friday night's semi-final Ofahengaue and Ese'ese are averaging 102.3 metres per game from 33 and 35 minutes per game respectively with Pangai Jnr averaging 85.2 metres from 26 minutes a game. Among the Brisbane forwards only Josh McGuire averages more metres than Ofahengaue and Ese'ese and starters such as Alex Glenn revel in the energy and power that they bring to the contest. "Bro it excites me. He's a bloody tough runner and I don't look forward to having to tackle him next year that's for sure," Glenn said of Ese'ese's high-powered charges. "I lift when him and 'Joffa' come on and they're busting the line and getting quick play-the-balls. "I tell them every week before we run out there to bring the energy when they come on and to their credit they've been doing that and they're really capitalising for our team. "It's a game-changer when they come on and the other forward pack's tired and they're crashing the lines." Starting prop Adam Blair has been working closely with both Ofahengaue and Ese'ese both on and off the field and believes there is a growing maturity to their approach that is proving a great benefit to the team. "Those boys have been really good for us this year. Herman has turned the corner, Joe has had his better year," Blair said. "He's made a commitment to himself that he's going to be a better person and a better player and he's worked really hard on those things in the off-season and the same as Herman. "It's about the things you do off the field as well and I think that's where I kind of come in a fair bit, is trying to get them to be around the people that are going to help them. "That's the part I enjoy the most and then I get to come out here and give them tips on little things they can improve in their game and then they go into the games and do it. "I guess it's a bit of a reward for helping those boys." 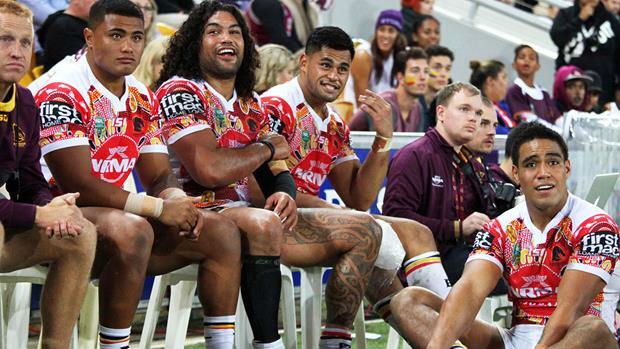 Twice in the past three weeks the Brisbane bench has been employed with a scoreboard heavily tilted in the wrong direction but Ofahengaue insists that whatever the score their job remains the same: get the better of Penrith's bench. "This year we've really nailed our jobs and found what our job on the field is to do and that's to hopefully bring some youth, enthusiasm and energy and change the game when we can," he said. "They've got a young bench too so for us it's just the same as every other week; our bench against theirs. "If we can go out there and add energy then we've done our job. Hopefully we do that on Friday night."